Way back in the late 1950s and early '60s there was a new working man evolving, a working man who believed his destiny no longer laid in the hands of the regimental and strict employers of the past. Derek was one such man, not for him were the shackles and constraints that kept so many of his counterparts tied to their employer. Derek had a vision and a belief that he was born with a talent not given to every man and he would do great things with his gift. And what was this talent? Well, I'll tell you, Derek was a carpenter and joiner. 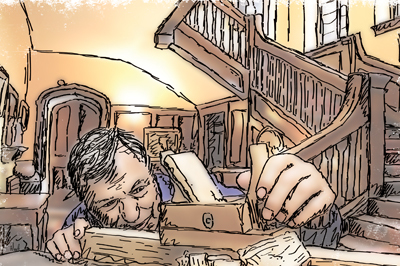 Oh, not just any old carpenter - he was a phenomenon, his work was so neat and tight and when bringing two pieces of wood together, it was almost impossible to see a joint. I have seen Derek hang doors that fit so perfectly you would have thought that they grew there. I think his talent stemmed for his unashamed and obvious love of wood; he would gain absolute delight in seeing the finished product even down to the very basics of our job. In an effort to forge ahead and leave his mark in this world he had somehow wangled his way in with a brilliant young architect who designed and managed renovations and rebuilds to some of the best houses in and around Highgate, London. As a carpenter it made a wonderful change to be working with top quality materials such as the elaborate and ornate hardwood skirtings and matching architraves, instead of the cheap and ordinary material used on site. Whereas on site we would nail these in place as quickly and as neatly as we could in order to earn a living, but here in Highgate, there was no such thing as time and the word 'quickly' did not even exist. Back then there was no such thing as the modern glues and every single piece of architrave and skirting, dado rail and panelling had to be secretly nailed and the cuts, joints and mitres had to be perfect - there was no Polyfiller on these jobs. Up to a point, no one cared how long it took to hang the doors, fit the stair cases with their elaborate twists and turns, or any other task that fell to the carpenter as long as it was perfect. Of course we made mistakes and new timbers were brought in and that's where my Dad came in. It's been my experience over the years that a serious woodturner can smell a piece of hardwood going begging from a hundred yards away. Dad was no exception and it all started when I would bring him home the odd piece of mahogany (Khaya ivorensis) hand rail or perhaps a couple of spindles left over from a staircase, but it wasn't always easy on this particular job as the gardener would come in most days and take them away to his potting shed. Mum always knew where I was working as I made a point of telling her in case she needed me, but nevertheless, God bless her, she would sit beside me as I ate my evening meal and begin to sweet talk me into taking Dad into work with me and she would always start the same: "Where are you working this week, David, still in Chingford?" "No, Mum, I'm in Highgate; I have been for the past two weeks." "Ooh, Highgate that's posh! You've got to have money to live there, boy," she would say. "Yeah, I expect so, Mum, the house Derek and I are working on belongs to some old and famous film star," I'd reply. "Ooh! Fancy that, my son working on a film star's house, Daddy will be proud when I tell him." "He already knows, Mum; I told him a couple of days ago," I'd tell her, and then she would suggest I show Dad where I was working as he could get so bored on his days off. Bored, that's a laugh! I've never known my Dad to suffer one single moment of boredom. There was never enough waking hours for Dad and his turning. The funny thing is I always knew that it was Dad who prompted Mum to ask me to take him along to work and as long as no-one at work had a problem with this then neither did I. In fact, Derek, like most people, liked Dad because he was such an easy going and gentle man. It was around June and all of Britain was enjoying a long and bright start to the summer. Along with other trades, Derek, Dad and I had taken to sitting in the rear garden at break times. The garden was no ordinary and usual postage stamp of a garden as was the norm in town, but a long, wide and colourful oasis in an otherwise capricious mixture of houses and gardens. On the second day, Dad had taken to talking to the gardener and the pair would disappear into one of the brick built buildings at the end of the garden and Dad had suddenly stopped bringing pieces of timber home; I never asked why and he never said. He even stopped joining us at break times spending most of his days with the gardener up in the, what I presumed to be, potting sheds. On the fourth day I thought I best have a word with Dad as he was taking up a lot of the gardener's time and I didn't want the poor fellow to lose his job. On the way home that night, I approached Dad about it and he laughed as if I had just told him a funny joke. "It's no joke, Dad," I said, "the poor man might lose his job." "I don't think there's any chance of that, David," said Dad, smiling. "What makes you so sure that this film star, whoever he is, won't sack him, Dad?" I asked looking rather concerned. "Because he is the film star, David," he replied. Dad had enjoyed this little banter and the secret he'd managed to keep from Derek and I; I never knew the old boy had so much devil in him. It turns out that the famous actor and comedian was into turning and the pair became friends through their shared hobby. 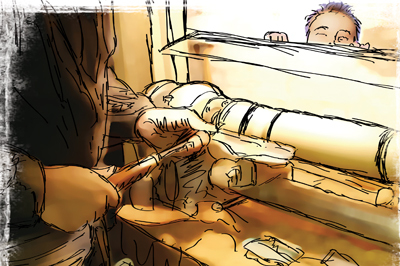 He even visited Dad's shed on the odd occasion and to be honest, despite him being rich and famous, he came across as just an ordinary man with no side to him at all and in all honesty, I think he was humbled by Dad's ability at the lathe and knew he was in the presence of a master turner. Being quite young myself the actor was famous well before my time, so I never really knew of him or the films he had appeared in, but Mum knew him and loved telling the neighbours we had a real live film star in the house. As for Dad, he was totally unphased by the man; to him he was just Henry, a fellow turner.